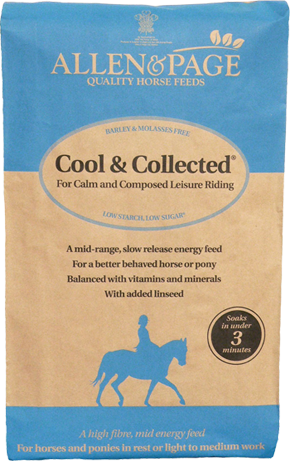 Cool & Collected has been specially formulated for horses and ponies at rest or in light to medium work. 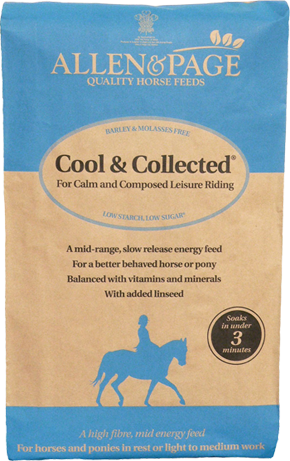 Cool & Collected is low in starch which makes it ideal for horses and ponies that tend to become fizzy on traditional midrange energy feeds. Using only the finest Non-GM ingredients, Cool & Collected contains a unique blend of prebiotics and probiotics and is balanced with vitamins and minerals, providing all the nutritional requirements for optimum health. Cool & Collected’s quick soak formula means it is ready to feed in just 3 minutes, forming a soft, palatable mash. Feeding a moist feed such as Cool & Collected has the additional benefit of helping to provide extra water in the diet. Cool & Collected can be mixed with warm water in cold weather if you wish to provide a tasty, warming feed. Also suitable for horses and ponies in light to medium work who may struggle to chew due to worn, loose or missing teeth. the feed changing colour slightly through the seasons. A COMPLEMENTARY FEED for feeding to HORSES. Introduce a new feed gradually over 7 to 10 days building up to the amounts needed to maintain condition and energy levels (0.5 – 6.75kg depending on size, type, workload and condition). Place feed in a shallow bucket, add twice as much water as feed, then stir. Wait 2 to 3 minutes before feeding this product. 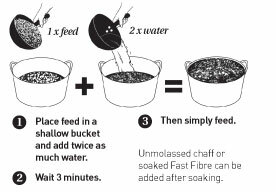 Dampened, unmolassed chaff or soaked Fast Fibre can be added after soaking. This feed may not be suitable for laminitics – if your horse is prone to, or has, laminitis why not try Fast Fibre? Do not feed to sheep. Introduce a new feed gradually over 7 to 10 days building up to the amounts needed to maintain condition and energy levels (0.5 – 6.75kg depending on size, type, workload and condition). Place feed in a shallow bucket, add twice as much water as feed, then stir. Wait 2 to 3 minutes before feeding this product. Allen & Page cannot be held responsible for any problem encountered if the feed is not prepared in accordance with our recommendations. This feed should be fed with forage and fresh water.